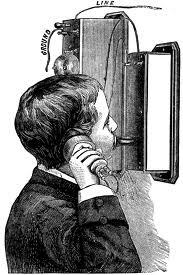 Insert the words Social Media in for the telephone above and you have the same conversation going on over a century later. I hear business owners all the time saying “I don’t do the Twitter Thing” like resisting it is somehow a badge of honour. Not having a presence on Facebook and Twitter for your business is like not answering the phone–it may feel nice and quiet for a while but sooner or later it will catch up to you. Customers will call somewhere else. All businesses will need to embrace social media soon so that they can join the conversation that’s already happening. Successful businesses will find a way to bring a human personality to these various platforms. The ones that don’t do this will be sitting by their telephone…waiting for it to ring. This entry was posted in Social Media, TInhorn Creek and tagged business, customer, facebook, telephone, twitter. Bookmark the permalink. Good points, here is a tweet that I posted “wineries I have followed you, you have not followed back. How are we supposed to interact, how do I get to know you Why would I buy from you” I have X amount of dollars to spend on wine, who am I going to buy from ? The wineries that engage me. or the ones I know nothing about. I have a cellar modest, but looking at it , most of the wines I have are from people who have engaged with me. Wine can be quite a personal buying decision. Connections with the wine/winery/people/vineyards definitely helps. Thanks Frank for the comment! I would probably not call your cellar “modest”! Thanks Frank for the great comment! Yes there are some that just don’t get it. Some have Facebook pages and/or Twitter accounts and never post updates. It’s about the same as selling the idea of having a website to an established business that has survived so far without one. Unless they have kids or grandkids bugging them that they need to be on the net, they just don’t get it. Agreed. It is hard for a lot of businesses to keep their website up to date as well. It has to be in the control of the business in my estimation so that it remains relevant to what’s going on at that company at the time. Besides the personal interaction with customers and potential customers I see much of the BC wine industry is using twitter for dialogue amongst colleagues, and that’s awesome. Cooperating amongst “competitors” is increadibly important to growing an industry. In some industries social media is best focused on fellow colleagues than it is on customers. Think of the boring industries you don’t really care about outside those very few times you need them. How many people care to foster social relationships online with the plumber or locksmith? Not too many. Agreed. Some industries lend themselves better to interactions with social media than others. I was thinking about some local businesses (like plumber etc) and their business would probably not get a push with twitter the way the wineries do. But, if they are on a personal account and interacting, and people know they are a plumber, then perhaps it could add to your business locally getting the first call. I’m not sure. Sorry about the comment form. I need to work on the entire blog format but since I’m self taught I tend to take too long to figure out these things! That said, there are always the exceptions. The plumber who just happens to be a true social butterfly and has built a huge local following. There the interaction is mainly personal and not business. Done well you’d just need a note in your bio that you are a plumber and a link to your site and only interject business related stuff into your social stream once in a while. Just enough to let your followers recall that you are indeed a plumber. The key to marketing via social networking is to be social more than you are marketing, so to speak. If all you do is push marketing messages nobody will be that keen on following you, let alone paying attention if they have clicked that follow button. Then there is the whole filtering thing that Facebook does. You may be following 1000 people but really only interacting regularly with say 20 people. Facebook knows that and will filter out much of the crap on your wall from the remaining 980 people. So from a small business/marketing perspective, the number of FB followers you have is a pretty meaningless number unless you can be engaging enough of them on an often enough basis to overcome those filters. Wineries are in the enviable position that wine is very much a social product. Makes it easier to play so many different roles and angles with social media. Personal interactions, business related interactions with colleagues, suppliers, distributors, etc. and interjecting some marketing pushes out to customers once in a while. And because wine is inherently social, as is running a winery and doing tastings and tours and having a restaurant and all that, social media then is a must for a successful winery in the long term. I tend to follow people back on twitter and not judge that they may or may not fit into a “potential customer” category. I have found some amazing connections (both personally AND professionally) from followers I never dreamed would have anything to do with me or Canadian wine. I have just started unfollowing people who have not tweeted in a month because there is probably little hope that I will ever interact with them. I think that success in a twitter account is your amount of tweets that begin with the “@” symbol. It means you are connecting and not just projecting. Do you feel the same? Thanks for all the great comments made. I am on a panel in Vancouver next week on social media and the wine industry and your comments have really given me some excellent things to think about in preparation for that! Thanks for posting such an eloquent and to-the-point piece on how social media is transforming the way customers and brands engage with one another. I wholeheartedly agree with your point that customers expect to interact with a real person, not just a twitter handle. The brands that are most memorable for me are the ones that let their personality come through and are genuine in the way they engage with their community. It is always a hard line to walk letting your personality out and not being so controversial that people turn off your brand! Thanks for your comments! From one who frolics through social media as a large part of her work day, good job! Concise and true – rare and delightful qualities in posts and tweets. Your talent and commitment are appreciated and, as always, I look forward to more.